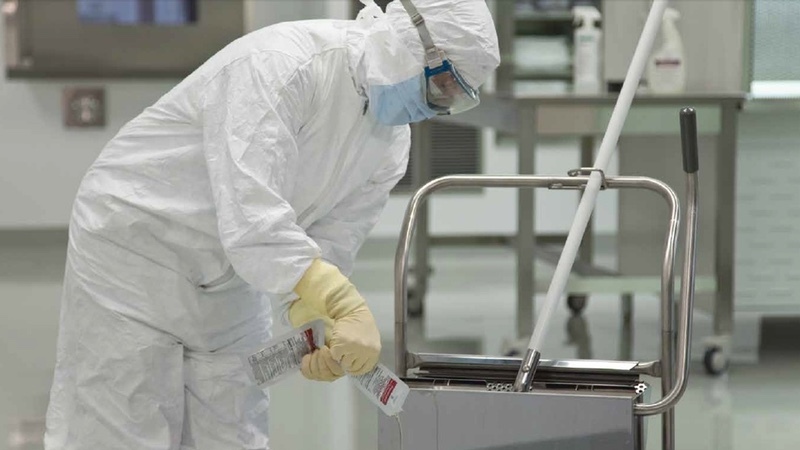 Cleaning and microbial contamination control are critical focus areas in the (bio)pharmaceutical and medical device industries. Robust cleaning and disinfection programmes are required to prevent adulteration, cross-contamination, and microbial contamination of products. Consequently, the selection and number of disinfecting agents used, the frequency of application, and the rotation of (one or more) disinfectants along with a sporicidal agent should be justified by a formal microbial risk analysis (MRA). The MRA and the chosen cleaning and disinfection programme should be supported by periodic review of relevant environmental monitoring (EM) data, and regular auditing of the cleaning and disinfection programmes. Inadequate programmes cause significant risk to patient safety, not to mention financial loss to the company and product recalls. “The program should contain procedures for screening and classifying bacterial isolates in each manufacturing environment. “Cleaning agents and disinfectants should be validated for their appropriateness and reliability in removing contaminants prior to use. “Cleaning and disinfection efficacy should be assessed and confirmed based on type and count of microorganisms characterized by periodic environmental monitoring. “If selected disinfectants might have inferior efficacy against microorganisms isolated from the environment, the efficacy should be reevaluated and the replacement with or alternate use of different disinfectants should be considered and implemented, as appropriate. “Therefore, a sound disinfectant [programme] also includes a sporicidal agent, used according to a written schedule and when environmental data suggest the presence of sporeforming organisms. “Article 315. 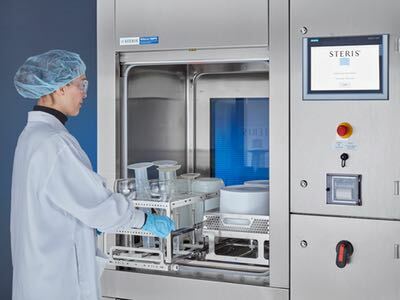 The sanitation of clean areas is particularly important in the manufacture of sterile products. These areas should be cleaned and sanitized frequently, according to a specific programme approved by QA. The Pharmaceutical Inspection Convention Pharmaceutical Inspection Co-Operation (PIC/S) – PE 009-13 Annexes (2017) requirements regarding disinfectant rotation are similar to the EudraLex Annex 1 (2008). Based on these excerpts, the reader might be confused about the rotation definition. Is it one disinfectant alternated with the use of a second disinfectant? Or, is it one or more disinfectants with a sporicidal agent? The rotation definition should be adequately defined in the cleaning and disinfection procedures. “The rotation of an effective disinfectant with a sporicide is encouraged. It is prudent to augment the daily use of a bactericidal disinfectant with weekly (or monthly) use of a sporicidal agent. “Other disinfection rotation schemes may be supported on the basis of a review of the historical environmental monitoring data. “Today, most firms use a system whereby a disinfectant is rotated with a sporicide to more effectively reduce the bioburden levels. 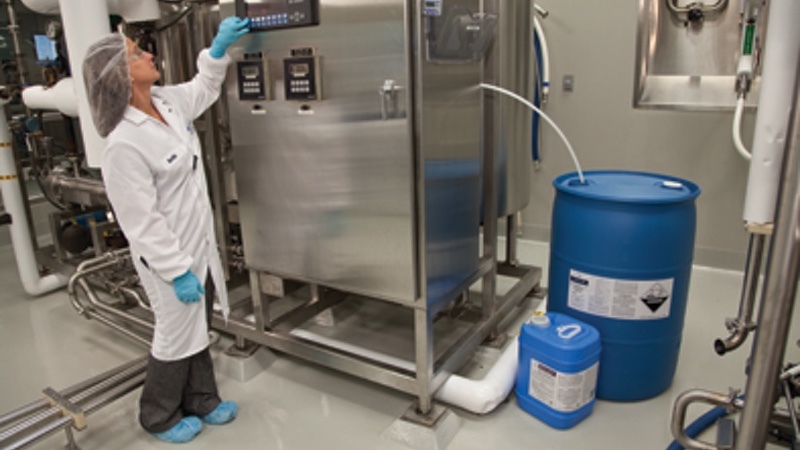 The regulatory guidelines agree that a routine disinfectant must be active against vegetative microbial flora recovered from the facility or isolates. The effectiveness of the disinfectants and sporicides must be demonstrated through a disinfectant validation (lab testing such as suspension and coupon testing, and in-situ testing) and confirmed through EM and data trending over time. The EM programme should be designed to detect most frequent isolate microorganisms and worst-case microorganisms (e.g. spores or fungi) or "resistant" strains/microorganisms. The terminology used by the USP “most frequent isolate" is deemed more accurate for (bio)pharmaceutical and medical device firms than the term "resistant microorganism.” It is expected that where EM data shows the presence of spore-forming organisms a sporicidal agent will be used. This last statement is not specified in the current EU GMP Annex 1 (2018). The new 2017 draft EU GMP Annex 1 requires that the cleaning and disinfection programme should include periodic use of a sporicidal agent. The regulatory guidelines are not aligned regarding the number of disinfectants required in conjunction with a sporicidal agent (disinfectant rotation). The new Annex 1 (available for public consultation until 20 March) proposes that, “More than one type of disinfecting agent should be employed and should include the periodic use of a sporicidal agent”. This, however, goes against the quality risk management principle promoted in various recent EU guidelines revisions. 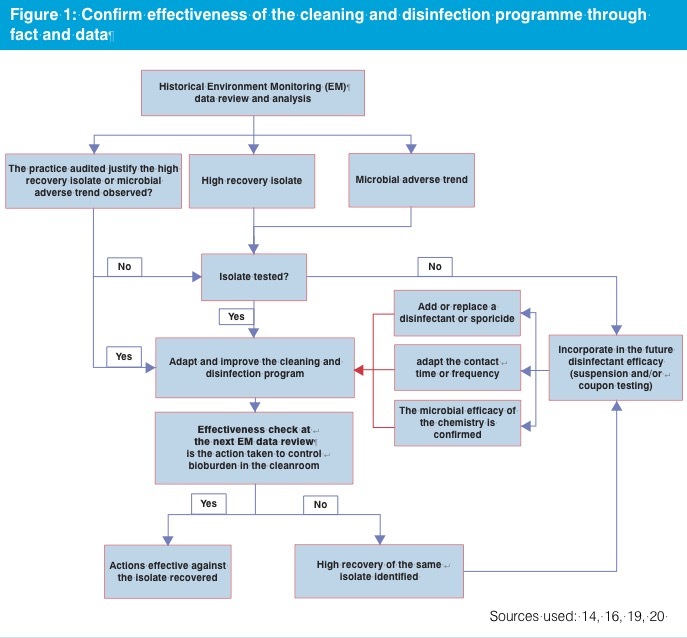 The cleaning and disinfection programme should be considered as part of the EM programme lifecycle approach. Consequently, the number of disinfectants used along with a sporicidal agent should be justified by a formal MRA, periodic EM data review and periodic auditing of the cleaning and disinfection procedures rather than being arbitrarily imposed. 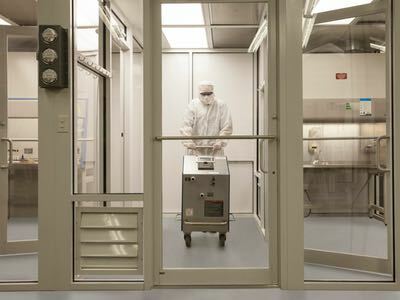 Such circumstances should not arise in a typical cleanroom. Also, Sutton states that, “Selection of mutants that are resistant to in-use levels of disinfectants has not been shown to happen in cleanroom settings. Literature reports of resistance to in-use levels are restricted to descriptions of survival of specific microorganisms in contaminated solutions”. Therefore, the dilution, the filtration and the storage must be performed effectively to avoid microbial contamination of the disinfectant solution. However, since a sporicidal agent has an inherent corrosive nature, it is typically not recommended for daily use. Hence, if one broad-spectrum disinfectant along with the periodic use of a sporicidal agent covers the largest microbial spectrum, and is effective to control microbial contamination, adding another broad-spectrum disinfectant may not add value. The rotation of two disinfectants with the same microbial efficacy profile is baseless practice. 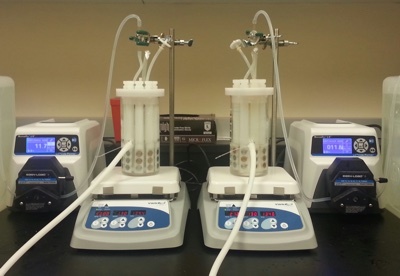 Rotation of two disinfectants should only occur with two different types of chemistries, or similar chemistries with two distinct microbial efficacy profiles, due to other aspects of the formulations. The complementary microbial actions should ensure that the alert level is not reached. Routine disinfectants should be used daily for cleaning and disinfection of non-product contact equipment to effectively kill vegetative microorganisms and remove soils, while minimising the risk to staff and cleanroom surfaces. The use of a detergent (for the cleaning step) should be defined based on the soil level of cleanroom surfaces, the composition and effectiveness of the disinfectants, e.g., a surfactant in the composition will help to clean and disinfect. A sporicidal agent should be used periodically to kill sporeforming bacteria (e.g., Bacillus species). The frequency of use should be based on the MRA results, area classifications and historical EM data. Note that the frequency of use of a sporicidal agent might be higher inside a restricted access barrier or isolator (ISO 5 or grade A area) than in a lowest grade classification. This situation is justified based on the area classification, microbial specification and the cleanliness of the non-product contact surfaces inside such areas. As a consequence, it justifies a reduction in the use of routine disinfectants. Disinfectant and sporicidal agent residue should be periodically rinsed using 70% isopropanol (IPA) or water for injection (WFI). 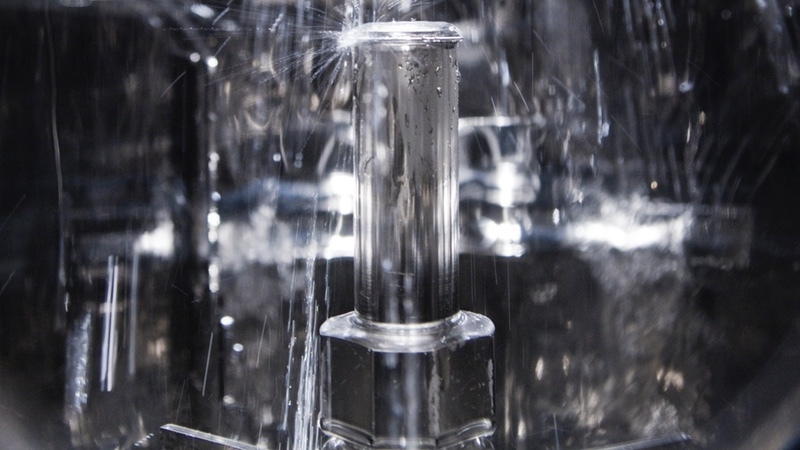 The rinse frequency should be set based on a visual inspection and tactile observations of the surfaces in the cleanroom. There are cases where residues become such an issue that a cleaner is needed (e.g. sticky, tacky, or slippery floors or doors) and then the cleaner residue is rinsed using purified water or WFI dictated by the area classification. The periodic rinse could be integrated into the cleaning step when a detergent is used prior to disinfection. The number of disinfectants, their rotation and programme frequency should be justified based on the MRA results, disinfectant and sporicide microbial efficacy profiles, area classification, and review of the historical EM data. For a new or entirely revamped facility, the justification should be based on the MRA results, disinfectants and sporicides microbial efficacy profiles and the classification area. The environmental control programme, including EM, cleaning and disinfection, qualification and periodic re-testing of the disinfectants should be looked at as a lifecycle approach (feedback loop). Indeed, the historical EM data review (Figure 1), is one of the triggers to adapt or improve the cleaning and disinfection programme and confirm that the disinfectant and sporicide microbial efficacy profile, and spectrum is adequate. Confirm the absence of the increase in excursions from the previous historical EM data analysis. Identify the specific re-occurrence of trend or adverse events (e.g. the recurring deviation with the same microorganism or recurring excursion on the same sampling position). Categorise the source of isolate and contamination factors. Conclusion and actions, however, could only be confirmed if supported by an audit of the cleaning and disinfection procedure. The goal of the audit is to demonstrate that the personnel and the microbial contamination control practices are compliant with the defined procedures. Moreover, the audit aims to confirm the absence of improper practices in the manufacturing area, e.g. ineffective chemistry applied, suboptimal concentrations, errors in dilution, wet contact times not in line with the disinfectant qualification data report or presence of visible residue affecting the efficacy of the disinfectant. Finally, based on the historical EM data analysis and the audit results, the team can confirm if the cleaning and disinfection programme should be adapted or improved, if a disinfectant or sporicide should be replaced or added, and if the contact time or frequency should be reviewed. This approach corresponds more to a lifecycle risk-based approach rather than an arbitrary approach. Depending on the regulatory guidelines, it is expected that at least one disinfectant should be used to control routine vegetative microbial flora. Also, periodic use of a sporicidal agent is justified if the historical EM data confirms the presence of spore forming microorganisms. Effective risk management principles must be integrated into the product lifecycle to minimise microbial contamination, ensure the safety, quality and efficacy of the product. The manufacturer should incorporate the EM programme, including the cleaning and disinfection programme into the risk management strategy used and the product lifecycle to confirm product and patient safety. The goal of cleaning and disinfection programmes should be beyond elementary regulatory compliance. The disinfectant rotation and rotation frequency must be based on the results of the microbial risk assessment, the chemical agent microbial efficacy profile, periodic audit and the historical EM data. 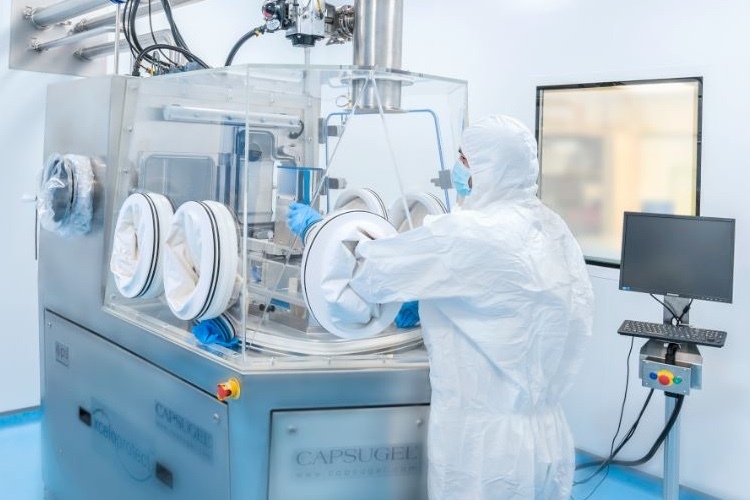 Compliance will be reached if the cleaning and disinfection programme is capable of controlling the bioburden level in the cleanroom to acceptable levels. United States Pharmacopeia 38 (USP) <1072> – Disinfectants and Antiseptics. The United States Pharmacopeia Convention/National Formulary, Rockville, MD. United States Department of Health and Human Services Food and Drug Administration, Guidance for Industry Sterile Drug Products Produced by Aseptic Processing — Current Good Manufacturing Practice, 2004. Regulatory Science of Pharmaceuticals and Medical Devices from Ministry of Health, Labour and Welfare of Japan, Guidance on the Manufacture of Sterile Pharmaceutical Products by Aseptic Processing, 2006. Sandle T., A guide to cleaning and disinfecting cleanrooms, 3rd edition, the CDC Handbook, 2012, p.173-180.